Ever tried to get to something on the ceiling but at the thought of carrying the traditional ladder, you simply decide to let go. Well, gone are the days when you could knock things down, struggle to carry along a rigid ladder or even hurt yourself. In today’s modern world, telescoping ladders have taken over. They are not only light and retractable but also budget-friendly. With a telescoping ladder, you can have control over everything that is above your head. 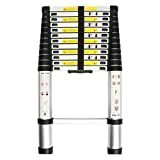 Top on our list is the outstanding Xtend & Climb Telescoping Aluminum Extension Ladder. Opening up to a whopping 15.5ft and retracting to 36.5 inches, this ladder makes the perfect choice for both domestic and commercial needs. It is not only portable but also lightweight to be transported anywhere. Nothing will prevent you from carrying your jobs that are at a higher level from the ground. The easy no-pinch closure system allows to you extend and lock this telescoping ladder at your desired height. Integrated carry handles are also included to help with carrying. Non-slip end caps keep the ladder stable and still. Moreover, the fine clean-touch anodized finish not only adds to the elegance of this ladder but also prevents the unit from rusting. 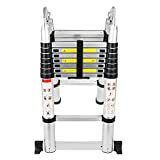 Even better, this ladder can fit in the smallest of spaces, be it in your hall closet storage sheds, car truck, garage among other places. Tired of the heavy traditional ladder when changing bulbs, installing equipment on the ceiling or painting? Well, let me introduce you to the WolfWise EN131 Telescoping Ladder that retracts to a quarter of its size and can be extended to 12.5ft. Even better, it is made out of a high-quality aluminium alloy that withstands rust among other harsh conditions. You can unlock the ladder in 1ft increments depending on your personal preference and the type of job at hand. Heavy-duty straps are included for convenient carrying and transportation from one place to another. Each section is designed in such a manner that the user won’t get injured when opening and closing. Plus, long-lasting non-slip caps are put in place in order to enhance safety by holding the ladder firmly. The 6061 Thick aluminium construction is sturdy enough to support up to 330lbs. Overall, this is a multipurpose strong ladder that won’t disappoint. The Yesker Telescoping Aluminum Ladder is another outstanding unit that delivers large reach potential for both home and commercial users. Despite boasting heavy-duty aluminium construction, this ladder is lightweight for easy transportation. Even better, it retracts to approximately 34” for hassle-free storage in any small space. The extending rungs are integrated with a spring-loaded locking mechanism to enhance safety. Kindly note that this ladder can accommodate a maximum weight limit of 330lbs which is more than adequate. Extending to 12.5ft in 1ft increments, this unit will sort out all your DIY tasks both at home and at a commercial setting. When you need it big or small, the Telesteps 1600EP OSHA Ladder simply complies. Coming with a patented one-touch release mechanism, this unit has the best extending and retracting mechanism. It is also an OSHA-Certified Telescoping Ladder that extends to whole whopping 16ft. Nothing will stop you from being a DIY guy or a commercial plumber. You will love the lightweight design of this ladder that allows you to simply store inside your car’s truck or at your closet. Moreover, the 100% Silicone Pivoting Feet provides a firm grip giving you the confidence to handle whatever task you have above the ground. Another adorable aspect is the Aircraft-grade aluminium construction that is sturdy, lightweight and rust-resistant. If you need a sturdy telescoping ladder for your guttering business or just for home use, let me introduce you to the Luisladders Oshion Aluminum Ladder. It is a great choice that will increase your reach potential. It boasts a unique Extend and Lock Mechanism and thumb buttons click smoot, the reason it opens and closes easily without causing any injuries. Of all the robust features, what sets apart this ladder from the rest is the 4-in-1 design that allows users to use it as a twin, stairway, telescoping or two scaffold base ladder. It also features double grip handles, bottom caps and angled feet to ensure maximum stability and safety. Most importantly, its lightweight and compact size allow for convenient storage and transportation. Heavy-duty carry handles are included to help with transportation. Constructed from rugged 6061 Aluminum alloy, GoodLife EN131 is a top-rated telescopic ladder that does a great job. It easily extends and retracts taking you to whatever heights you desire. Just like other models, it has a no-pinch closure system, integrated carry handle and non-slip caps for greater security. 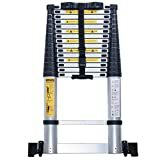 With a load capacity of 330lbs, this ladder will enable you to carry out all roof-related tasks, guttering and putting in place light fixtures. Featuring a telescopic design, you will find it easy to fold this ladder and conveniently store it in any small space. 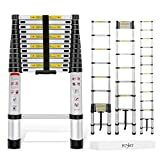 The ladder has a total of 12 steps and extends to 12.5ft within seconds. Overall, it is a great choice for both commercial and home use. If you are looking for a telescoping with greater applicability, then nothing beats the WolfWise Anti-Skid Telescopic Aluminum Ladder. It boasts several robust features to make your work easier. To begin with, the top of the ladder is integrated with removable non-slip sheath while the bottom has a non-slip base. For easy transportation, the ladder is not only lightweight but also features rolling wheels. Depending on your needs, you can unlock each section in 1ft increments. Plus, the ladder is designed in such a manner that one opens and closes the ladder without injuring fingers. It is also very stable for additional safety. For a multifunctional telescoping ladder, the 15.5ft WolfWise makes the best choice. Another incredible way to get to your roof or higher level is through the Finether Multipurpose Aluminum Ladder. 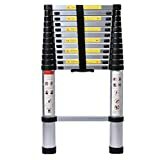 With a maximum load capacity of 330lbs, this is a very nice ladder for home use when doing light fixture installation, wall repair, painting among other light tasks. Carrying around and storing this ladder is pretty simple owing to its lightweight and portable design. Plastic finger protection spacers and non-slip caps boost safety and prevent injury. The aluminium alloy construction is sturdy and EN131 Certified. 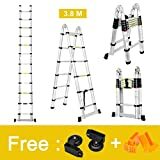 Expect to extend up to 12.5ft when using this multipurpose ladder. A-Frame plus the locking features are other robust features of Finether. Always top in the market is the quality-constructed Xaestival Telescoping Aluminum Ladder. It is a robust model that is sturdy with a load capacity of 330 pounds. What pushes this ladder up the ranks and completely sets it apart from the rest is its top-notch adjustability. Each locking section is independently operated giving you the opportunity to configure your preferred height. Scientific design allows for easy extension and locking. No more worries of your fingers getting hurt as is it the case with poor-quality models. You can extend this ladder to a whole whopping 15.5ft and retract the same to ¼ of the initial size for convenient storage. When retraced to approximately 37inches, this ladder can be stored in a car truck, hall closet, under beds or any other smaller space. Another compact option that will make you a perfect DIY and folds easily to about 34” for hassle-free storage. It is pretty durable owing to the Aluminum alloy frame and sturdy enough to take up anything with a maximum weight limit of 300lbs. The two steel locking pin mechanism ensures maximum safety. Plus, non-slip rubber caps are well fitted in place to prevent any fall injury. 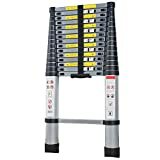 This extendable 13-steps telescopic ladder also features plastic pillars between the steps so as to protect your fingers and injury. 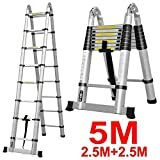 Overall, if you are looking for an easy to manoeuvre, lightweight and sturdy telescoping ladder, the Senrob Multipurpose Ladder makes a great choice.